My new job at Temasek Polytechnic has brought me home to the eastern part of Singapore after 4 years of working in the west. After discovering that the park connectors took me almost all the way there, I decided to move away from public transportation and worked out a way to ride to work. Thank you so so much NParks! I dusted off an old bike I’ve had for a number of years, took it to Song Seng Chan bicycle shop in Joo Chiat and retrofitted it with a comfortable seat, lights, a bell, an airhorn and slicks (tires for road, rather than off-road). The ride to the new workplace is extremely comfortable and relatively safe. It’s also a good 15 minutes faster than the sinuous bus route. 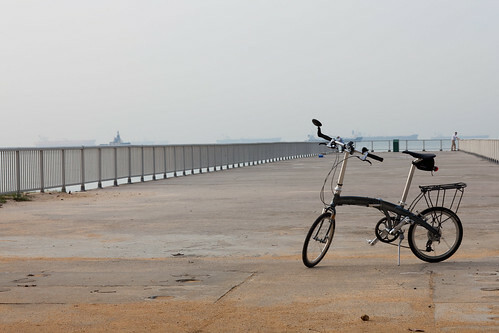 Wanting to get a second bike so that Faith and I could go riding together, I opted to buy a 3rd hand Dahon mu SL, which was a stretch over my budget, especially given the fact it would be my first foldable bicycle. What can I say, I’m so smitten with riding around Singapore, and the bicycles have opened up a whole new world. The park connectors are a godsend, though the Kallang one is undergoing some work and gave me a thorough workout having to carry my heavier bicycle with packed bags up 3 tall overhead bridges. But I’m thankful that Singapore is shaping up to be a real garden city if we bike commuters do our homework before setting out. Busy roads are still a tad dangerous and Singaporean drivers aren’t known for their compassion or grace. The mu SL, being a foldie, offers a great amount of freedom. I can now choose to ride one-way, pack the bike in the boot of a taxi on the return leg or take the train to a faraway destination (yes I’m romantising our tiny island, but give me that little stretch of imagination will you) and hit the road on the 2-wheeler. Riding around has given me a better appreciation of what we have here. Great weather, pretty good amenities and flat terrain. Watching Singapore open her sleepy eyes at dawn and wind down in the golden light of dusk — it’s easy to fall in love. 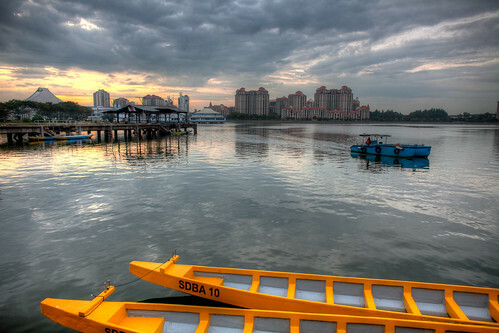 In recent years I have come to think of Singapore more of a city and less of a country. It has freed me from paradigms that do not exist, most chiefly that I am bonded to this place simply because I was born here. It is probably as absurd these days to claim an affinity based on geographical location of origin as it is to judge a person by their skin colour. It happens, but it is scarcely ideal. Singapore needs to become more than a place where our friends and families reside. Many of our friends have since migrated to other countries, and frankly, if we had the means, many of us would have moved our entire families elsewhere. It is not because we’re all ungrateful bastards, but there are some things we cannot find on this city-state. Where once relevant, I find our 2 main alternative political websites The Online Citizen and Temasek Review becoming increasingly disconnected and bitter, and neither traits aid the maturation of the citizenry. Sometimes the best news doesn’t gain attention; not everything stands on its own as a headline. Xenophobia has been gaining ground here in Singapore, and will continue to do so unless we actively combat it. It is far easier to pick on people who are different, than realising and accepting that it is in this diversity from which we derive our greatest strength. Singapore needs to evolve away from the very bare definition that a country is defined by geographical boundaries. Singapore needs to be a well-articulated idea. She cannot be everything to everyone. We can expect prices here to escalate; surely we are not exempt from these basic economic principles. What the government can do is mitigate the rate in which these things change. I’m sitting here watching primary school students visit the Merlion. I notice that many of them have digital cameras. The teachers are doing their best to create an enriching excursion despite the slight drizzle. I’ve spent the past few weeks riding up and down Singapore’s park connectors, checking the National Environment Agency’s 3-hourly weather forecast to see if my next ride will be affected. Say what you will, but I think the government has done a fine job in many areas. Yes, the website for the park connectors takes forever to load, and we can complain about that on our twitterfeeds or blogs and rant incessantly on how we paid our taxes but the websites don’t work. Or we could map out the connectors ourselves. Thing is, we have a lot more power than we realise. We who have some to spare can give to people who are in need. Now more than ever, we are able to rally together to support great causes or change the status quo. I’ll repeat it: Singapore needs to be a clearly articulated idea. I do not doubt that debate is healthy for the country, but when it descends to a never-ending stream of negativity, surely we need to search within ourselves if we have the means to change things. The idea that is Singapore is shaped not only by the work of her government, but by the actions of her people. We need to make this place something we, and our children, can subscribe to. Off a slide Tuck Soon tweeted while at a design thinking workshop. It encapsulates a lot of what I think are extremely relevant skills for the current and next generation. This whole cycling everywhere business has gotten me excited, especially to find out what other park connectors NParks provides. The NParks website is extremely slow, despite the fact folks have given them feedback more than a year ago. So rather than wait for them to fix it, I’ve traced all the park connectors into a single Google Map. February and March was supposed to be a time of rest before I head to the new job, but opportunity often knocks on the door when you least expect it. When I met Mark Surman in Singapore last December, I had no idea I would eventually become involved in shaping the Open Web Career Track Drumbeat Project along with John Britton and Philipp Schmidt. It was one of those requests that made me feel woefully inadequate, but I felt a deep affinity to its cause of providing accessible education to inculcate skills within the tech community — skills necessary to keep the web open and non-proprietary. John and Phlipp were extremely patient and kind to bring me up to speed. 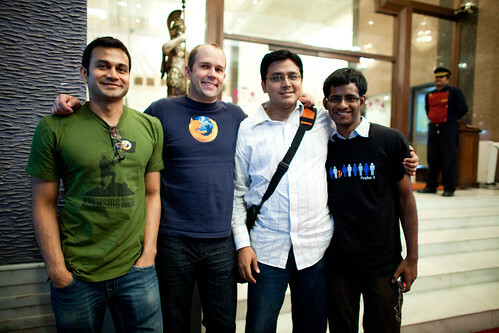 So when Mark asked if I could present the Open Web Career Track project at Mozilla Developer Day in Bangalore, I agreed. It is regrettable that I’ve never really traveled within Asia, and it would be my first time to India. 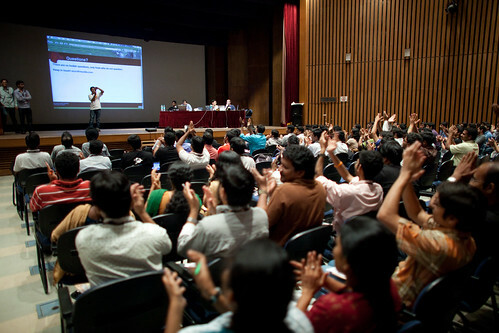 The crowd that showed up for MozDevDay was amazing. A full-house of about 300 people, on a Saturday, some coming from quite a distance away. 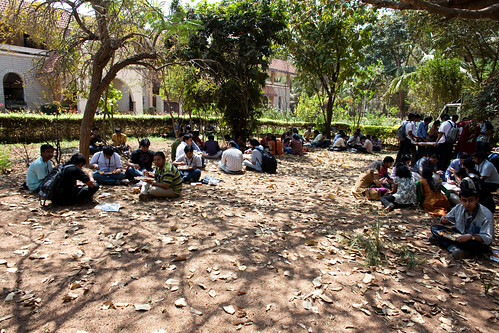 It was an eclectic experience: we talked pretty cutting edge tech in the hall — thanks to Arun — and ate sitting down on the grass patch under the noon sun. It was a departure from the sterile environment Singapore tech meetups are often held in, where the main complaint was always “why no wifi?”. It was a blast speaking to the audience. The Indian and Chinese cultures share so many similarities it was easy to point out (and subsequently joke about) our common idiosyncrasies. I’ve learned so much from the amazing people I met. In a land where there are places in poverty, open-source software means so much more than “why does OpenOffice mess up my Powerpoint slides?”. It is a means by which the poor can make themselves relevant in an increasingly technological world; where the oppressed can broadcast their plight to the rest of the world despite the best efforts of the oppressors to silence them. The web has changed the way in which we communicate and connect with each other. It has the potential to be a lot more than a giant corporate marketplace. We need to consciously keep it inclusive and available to everyone.